Ok, today is a SUPER special day and I have something really exciting to share with you that might just change your life. How do I know? Because 2 years ago when I first started using the Powersheets, they changed mine! I believe that living life well has to start with being really clear on what matters most. Sometimes it's easy to know what we want and where we want to end up, but oftentimes we get lost somewhere in trying to figure out a clear path to actually making it happen. That's where the Powersheets come in. They are an intentional goal planner that walks you through a simple, well-guided process of uncovering meaningful goals and mapping out an action plan for making those goals happen. In a nutshell: they help you decide what matters most in your life, set specific goals to intentionally cultivate those important things, and stay encouraged and accountable to actually take action consistently. What is the Powersheets process? Each set of Powersheets comes with amazing prep work sections that walk you step by step through defining who you want to be in the big picture and how to set goals that will get you there. After setting your goals, you'll be guided through breaking them down into doable action steps so you can tackle each day with clarity, intention and joy! The last part is taking your plans and putting them into action, and the Powersheets include a monthly tending list (absolutely my FAVORITE feature) that breaks your goals down into tasks to tend to on a monthly, weekly or daily basis. How do I use Powersheets? As soon as the new Powersheets become available each year (that's TODAY!) I order them and then spend a few weeks in December going through the yearly prep work. It's always a really sweet time that I thoroughly savor and enjoy. The prep work is really simple, straightforward, and well-guided, and includes a lot of reflection exercises to help you evaluate where you're at currently, and what you want to see happen in your life in the upcoming year. Throughout the year, at the end of each month I have a standing date scheduled to pull out my Powersheets, evaluate my progress for the month, review my goals, and go through the prep work for the upcoming month. This is one of my FAVORITE times each month because it ensures I stay connected with the overall vision I have for my life, take notice of where I've grown, and where I still have room to grow. Every quarter there is also a Goal Refresh section that gives you space to review and update your goals as you accomplish things and as your life or season changes. If this tool sounds like something that could be a good fit for you, but you want to know more and have some lingering questions, I encourage you to check out this 2019 Powersheets Collection Guide. It will walk you through all the different options available, as well as several other amazing intentional living tools designed to help you cultivate what matters most in your life. You can also check out this blog post I did at the beginning of the month to see how I use the Powersheets in real life to set, map out, and take action on my goals. The new collection just launched TODAY and friend - they always sell out fast, so if you're at all thinking you want to give them a try, don't wait too long to order yours! I don't think you need a pretty, fancy tool like this to set goals and make progress in your life...but in my experience, having a tool or system that simplifies and streamlines the process is priceless if it actually works. 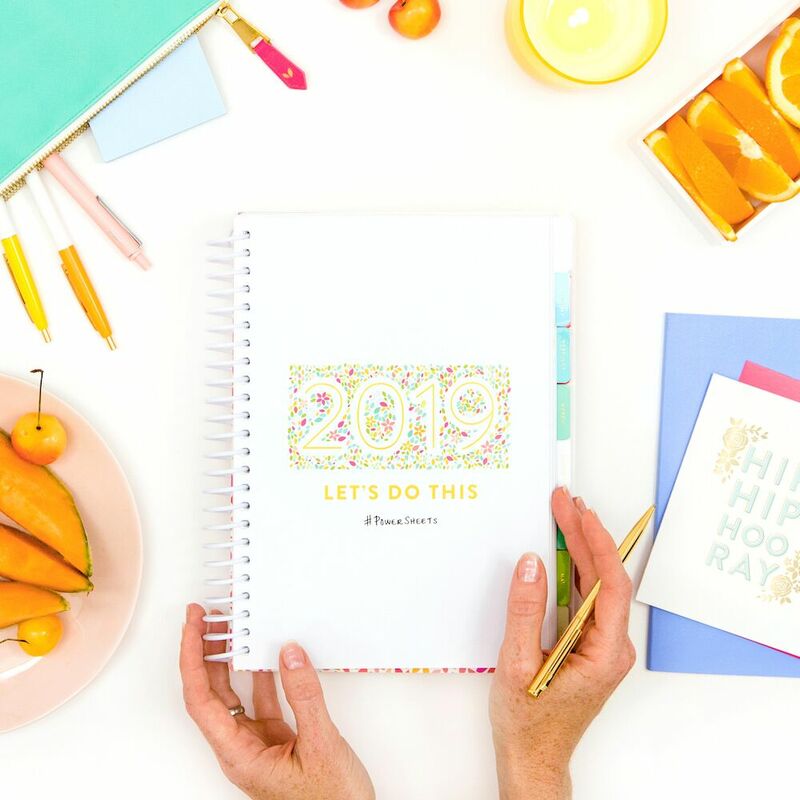 Are you ready to make 2019 your best year yet?! Click here to join me in using Powersheets to make it happen! !